Take a look at today’s modern bathroom designs and you’ll see the ever-popular wall-mounted vanity. Wall-mounted vanities, also known as floating vanities, are vanities that mount to the wall instead of the floor, freeing more floor space and creating a modern, streamlined look. Over the last five to seven years, they have skyrocketed in terms of appeal — but do you know why? What makes wall-mounted vanities so popular? To help answer this questions and dig deep into a hot bathroom trend, here’s a look at some of the key selling points for wall-mounted vanities, which may explain what’s made these bathroom vanities so beloved! Nothing says you’re moving away from traditional style faster or clearer than sleek, wall-mounted vanities. Because they step away from the classic look of a vanity and offer something different, these bathroom vanities provide a foolproof way to opt for modern style. At Modern Bathroom, we have wall-mounted styles that range from less than $400 to more than $3,000, providing hundreds of ways to create a contemporary look with a single piece. Whether you’re trying to move toward a modern look one piece at a time or you’re building a bathroom from the ground up, count on floating vanities to create contemporary style. If you’re trying to make the most of a small bathroom or add to the elegance of a large master bath, a wall-mounted vanity naturally makes the bathroom look bigger. Because it doesn’t sit on the floor, it creates an impression that there is more floor space than there actually is, making the space feel larger. This feature can go a step further when you pick a vanity that matches the color of your walls, so the vanity gives an illusion of almost blending with the space. Floating vanities not only come in a wide range of designs and styles, but the very fact that they float means they have more versatility in placement, too. You don’t have to place them in an area where there’s a stable floor or a flat surface. You can decide on the height of your countertop, adjusting it to your needs. This versatility is a big selling point in awkward layouts, for consumers who are very tall or short, and really for anyone who wants complete customizability in their bathroom vanities. Another feature of the wall-mounted vanity is portability. Generally, these vanities are lighter and easier to pick up than the large, floor-mounted models. While wall-mounted vanities can be harder to install, they are easier to move from place to place. Durable and sturdy, they are built to withstand the warping that can occur in a bathroom environment’s humidity over time. Higher vanities, the wall-mounted kind that are lifted off the floor, make it easier to get to your bathroom supplies. Rather than having to bend down and dig deep into the back of your storage space, you can reach items quickly. Likewise, floating vanities often feature a design that allows for more drawers and usable space, too. While trends come from somewhere, and the many features of floating vanities make it easy to see why they’ve caught on, the fact remains that they are indeed trends today. Popularity breeds more popularity, so being a trend has probably made floating vanities continue to be popular. When people are decorating their bathrooms and deciding on features, they will often look at other popular features. When magazines, blogs and design showcases are featuring wall-mounted vanities, consumers notice and the idea catches on further. Are wall-mounted vanities right for you? Whether you’re building a new home, renovating a bathroom, or just curious about the floating-vanity trend, understanding the benefits they offer is key to understanding why they’re so popular. From their versatility to the way they expand a bathroom’s sense of space, these bathroom vanities have a lot to offer. Explore the possibilities we offer at Modern Bathroom to learn more about this trend, or contact us to discuss options! Whether you go with bold bathroom paint colors or fun wallpapers that feature animals or shapes, you can quickly and dramatically change the feel of your bathroom with the walls. Another great wall-decorating idea is to paint the walls with chalkboard paint so your kids can enjoy a private blackboard on which to create and draw. Every time they want to draw, you can let them redesign the walls in their bathroom space, creating fun and interesting conversation pieces as they do. In any case, by being intentional with your wall decoration, you can transform your bathroom into a perfect place for children. Think about the decorative elements of your bathroom — the shower curtain, the floor mats, artwork to hang on the walls, towels to use each day — and look for options that highlight a kid-friendly feel. The market today is loaded with possibilities, whether you’re talking about an under-the-sea theme or products featuring your child’s favorite cartoon character. Explore the possibilities and see what works best for you and your kids. With all the time you spend in the bathroom, why not make it a learning opportunity as well as a functional room? Use wallpaper that spells out the alphabet on corresponding animals and shapes. Pick artwork with multiplication tables. Hang a shower curtain that features the ABCs. When your children look at the same educational information day after day in the bathroom, something just might sink in — you never know! Putting a small child’s chair in the bathroom serves multiple purposes. From a decorating standpoint, it can incorporate another lively color to add whimsy and style to the space. From a functionality standpoint, chairs offer places to store towels or toys, as well as easy locations for parents to sit during bath time. If your bathroom has the square footage to accommodate it, consider placing a small chair in the room. When you can’t completely overhaul the bathroom for kids but want to make it more enjoyable, consider removable wall decals. You’ll find all kinds of colorful, creative designs that you can stick to cabinets and walls at kids’ height. What’s especially great about these features is that you can remove them down the road, when kids get older or you want to rethink your design. When it’s a kid-friendly bathroom you’re after, try to think strategically about the features you choose! To give you a few ideas for where to start in making your bathroom more childlike and colorful, simply look at the suggestions above. From painting the walls playful colors to incorporating numbers and letters in the room, there are all kinds of potential for designing a fun and creative kids’ bath. What will you do to create the perfect bathroom space for your little ones? Try a few of these ideas to find out. In winter, you need all the cozy home features you can get — especially in the bathroom. On icy, uncomfortable mornings, the only thing worse than leaving a warm, comforting bed is leaving it for cold, hard floors in your bathroom. What can you do? Are there ways to create a warm feel even in a typically cold space? What bathroom features make the biggest difference in a bathroom remodel? The good news is, there are lots of ways to make a bathroom feel warmer, some of which are simple (like adding rugs) and some of which are more demanding (like adding a fireplace). Hard, durable, easy-to-clean surfaces like tile, stone and porcelain are long-standing bathroom favorites when it comes to flooring. The only problem? They’re cold. You can do something about this by installing floor heat. Underfloor heating systems can go in when you’re creating a new build or retrofitting — and the result is warm and comforting surfaces to step onto while getting in and out of a bath. 2. Install heated towel bars. Is there anything cozier than stepping out of the bathroom shower to warm, heated towels that you can wrap around your frame? Heated towel bars make this dream a reality. Install them into the bathroom to gain a little luxury in your daily routines. Adding textiles is a great way to add a warmer feel to any space. In the bathroom, this means bath mats or rugs that are soft and cozy. Floor textiles work beautifully in front of the tub, the bathroom sink and anywhere you regularly stand for extended periods. Other options for introducing more texture to the bath include hand towels, bath towels and curtains. 4. Decorate in warming hues. When it’s warmth you’re after, don’t overlook the power of visual changes. Choose decorating colors known for enlivening a space like red, orange, yellow or deep blues. These colors instantly add to the warm and welcoming feel of the bathroom, even on frigid days. Contrary to what you may have seen in other homes, there’s no rule that says bathrooms require boring lighting over the bathroom vanity. Think outside the box of standard flush-mount lights and choose an attractive chandelier or pendant light instead. In the bathroom, you have to make sure ceiling lights aren’t reachable from the bathtub, are properly grounded and up to code. Beyond that, there are a lot of possibilities! 6. Let in natural light. Windows and skylights let more natural light into your room, so, even though it’s winter, you can still feel sunshine when it comes. Also consider glass shower doors and bathroom mirrors that help reflect light throughout the room. The same windows that are letting in wonderful natural light could be the culprit for extra drafts and temperature chills. Test to see if your windows are letting in more air than they should by putting a piece of tissue around the perimeter. If it moves, you have an air leak that needs to be caulked to improve warmth in the bathroom. 8. Add a steam shower. The beauty of a steam shower is that you can step inside while the shower steams — letting your pores open and your body relax. While this bathroom addition is a big-ticket item and might not work in every space, if you’re in the process of redesigning, it’s worth considering. If you really want to go all out in creating a dream bathroom space, consider a sauna. A sauna is like your own heated haven, a place where you can warm up, cleanse toxins and more. 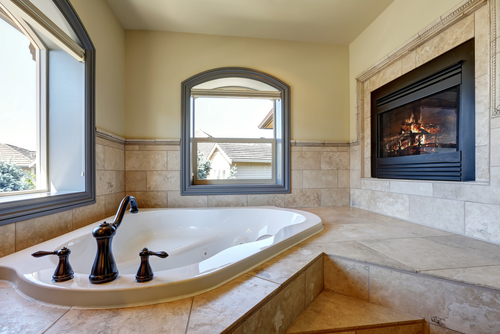 Picture yourself sitting in the tub with a fire roaring nearby, and you’ll see the appeal of a bathroom fireplace. While this feature is definitely a luxury, it’s a great way to create a cozy, getaway feel right in your home. Use the 10 ideas above to make your bathroom a little more inviting and enjoyable. Whether you’re planning a bathroom remodel or building a new home, thinking creatively about the bathroom can make all the difference in keeping the winter blues at bay.